Washington junior Dillon Steward (2) takes the ball to the basket, defended by Hillsboro junior Mason Swayne, during a Division II Sectional semifinal game Tuesday, Feb. 20, 2018 at Southeastern High School. Washington junior Ross Matthews Jr. sets for a three-point shot attempt during a Division II Sectional semifinal game against the Hillsboro Indians Tuesday, Feb. 20, 2018 at Southeastern High School. 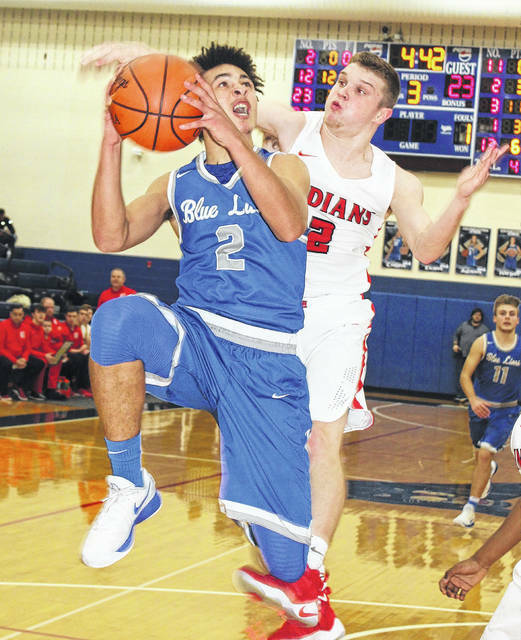 CHILLICOTHE — The Washington Blue Lions met the Hillsboro Indians for the third time this season, this time in the Division II Sectional semifinal held at Southeastern High School near Chillicothe on a very-much warmer than normal 20th day of February. The Blue Lions fell behind early, rallied and challenged for the victory in the second half, but, in the end, it was Hillsboro with the three-game season sweep, 58-52. The Indians (8-15) will return to Southeastern H.S. Saturday for a 7 p.m. Sectional championship game against the No. 1 seed Fairland Dragons. Washington ends its season with a final overall record of 3-18. Junior Ethan Watson was the game’s leading scorer for Hillsboro with 22 points. Senior Phil Mycroft scored 20 and sophomore Hayden Haines had nine. For the Blue Lions, junior Dillon Steward led with 19 points. He hit four three-points shots for Washington. Junior Evan Upthegrove sank three treys on his way to scoring 17 points. Junior Blaise Tayese also hit double figures with 10 points. “We played with six guys tonight,” Washington head coach Shannon Bartruff said. “I felt like that’s as much fight as this group has shown all year. That’s the conversation we had after the game. A lot of times you walk into a locker room after a Sectional or District game and you’re saying good-bye to four or five kids and we’re not saying good-bye to anybody. “We didn’t play consistently hard throughout the year,” Bartruff said. “As a coach, one of the biggest responsibilities I have is to bring my guys together; to find a way to get the most out of every kid we have and for them to respect each other enough that they are going to play hard, for their family and their school. We didn’t do that consistently enough. The Indians gradually built a 10-2 lead against the Blue Lions. With 39 seconds to play in the period, Upthegrove hit a three-point shot to make it 10-5, Indians, after one. Upthegrove started the second quarter the way he ended the first, by hitting a three-point shot to pull the Blue Lions to within two. Both teams would go on to increase their scoring output from what they achieved in the first quarter. However, Hillsboro still posted five points more than Washington to take a 26-16 halftime lead. Unofficially, the Blue Lions hit 6 of 19 shot attempts for 32 percent to 12 of 21 for 57 percent for Hillsboro in the first half. While Washington was able to improve its shooting percentage admirably in the second half, the Indians continued to have a hot hand over the final 16 minutes of play. By the midway point of the third quarter, Washington had pulled to within three points, 31-28. They later twice edged to within two points, only to see Hillsboro take a 40-33 lead after three complete. Hillsboro extended its lead to as many as 10 early in the fourth quarter. Again, Washington continued to battle and soon found themselves trailing by three, 48-45, with 2:48 to play in the game. Soon the margin would be five points, then three again as the teams traded scores in the final two minutes. Steward hit a two-point shot, then a three for a 54-52 score with 20 seconds to go. Hillsboro made 4 of 4 free throws in the last 17 seconds to seal the 58-52 victory. “We’re extremely thrilled,” Hillsboro head coach Bruce Miles said. “It’s always tough to beat a team three times in a season. Shannon’s banged up down there. He’s short some guys, so, give him a lot of credit. His guys fought and fought the entire game, which we knew they would. That’s a credit to Shannon and his program. We’re thrilled to be able to advance in this tournament. “Ethan Watson stepped up huge in the fourth quarter,” Miles said. “He put the team on his back. He got to the basket, he handled the ball well, made some huge free throws down the stretch. “I’d be remiss if I didn’t thank my coaching staff,” Bartruff said. “Brent Knisley, he wasn’t here tonight. His son, Max, is playing at Thomas More tonight. “Coach Ryan Day was on the staff this year and did a phenomenal job,” Bartruff said. “He’s been around basketball forever. “Adrian Parks, we kind of missed him the last couple of weeks,” Bartruff said. “He had some things change at work. Then, we had Laike Wallace, my j-v coach, along with Tyler Flora and Eric Downey. “I appreciate all the folks coming out and supporting Blue Lion basketball this season,” Bartruff said. WASHINGTON — Eli Lynch 1-1-3; Dillon Steward 2 (4)-3-19; Evan Upthegrove 4 (3)-0-17; Ross Matthews Jr. 0 (1)-0-3; Garitt Leisure 0-0-0; Blaise Tayese 3-4-10. TOTALS — 10 (8)-8-52. Free throw shooting: 8 of 11 for 73 percent. Three-point field goals: Steward, 4; Upthegrove, 3; Matthews Jr. Combined field goal shooting: 18 of 45 for 40 percent. Three-point field goal shooting: 8 of 23 for 35 percent. Turnovers: 15. HILLSBORO — Mason Swayne 0 (1)-0-3; Hayden Haines 3 (1)-0-9; Ethan Watson 8-6-22; Jakwan Clark 2-0-4; Phil Mycroft 9-2-20; Caleb Crawford 0-0-0. TOTALS — 22 (2)-8-58. Free throw shooting: 8 of 12 for 67 percent. Three-point field goals: Swayne, Haines. Combined field goal shooting: 24 of 43 for 56 percent. Three-point field goal shooting: 2 of 10 for 20 percent. Turnovers: 18.